Looking for a healthy no bake treat? 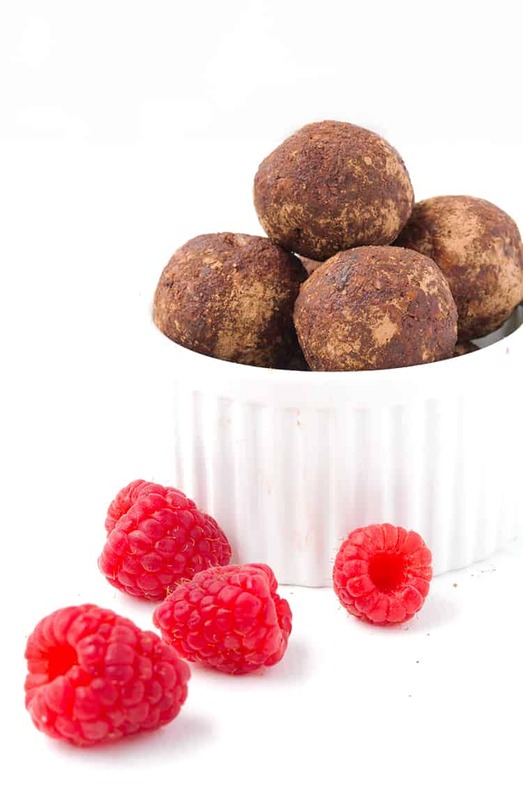 Try these delicious Chocolate Raspberry Bliss Balls made with almonds, cacao powder, coconut and raspberries. 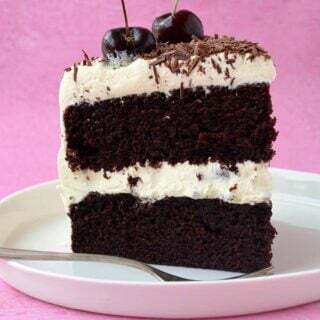 2018 is here and I’m celebrating with a healthy sweet today. These Chocolate Raspberry Bliss Balls are my everything. At just 100 calories a pop, these energy balls will help you keep your New Year’s Resolutions while also curing your sweet tooth cravings. 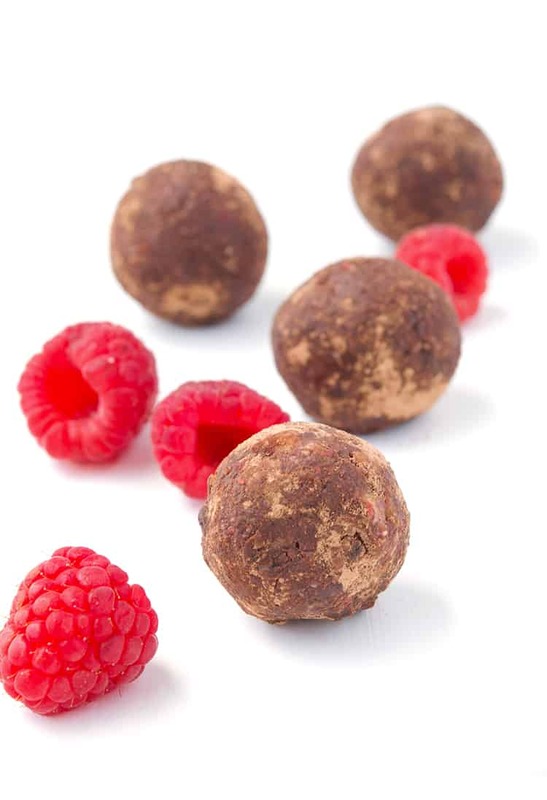 Sweet chocolate morsels with notes of coconut and raspberries. 2018 HERE WE COME. I don’t know about you but I’m a snacker. I remember when I graduated from university and landed my first real full time job. My boss walked by my desk one day while I was ‘mid-snack’ and said, “Gosh, you eat a lot!”. But what she meant to say was, “Jess you look great but eat constantly, what’s your secret?” Kidding. But it’s true that in the workplace these habits come to light, and while some can stick to their three meals a day, I need to snack through the whole day to survive. 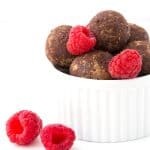 Enter these Chocolate Raspberry Bliss Balls AKA the perfect morning tea treat or post work-out pick-me-up. 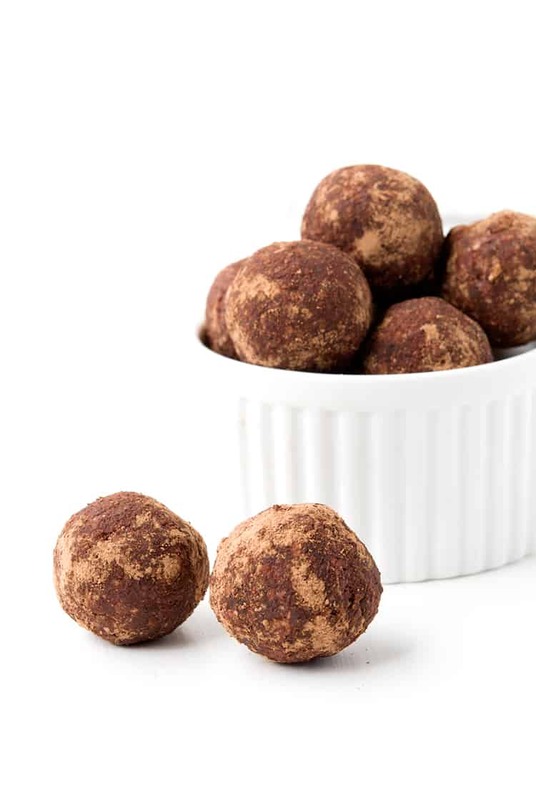 These easy, naturally sweet, chocolate bliss balls, or energy balls as they say, can be made ahead for the whole week. In fact, I’ve made a batch for this week already and they’re sitting in the fridge ready to eat when the cravings hit. 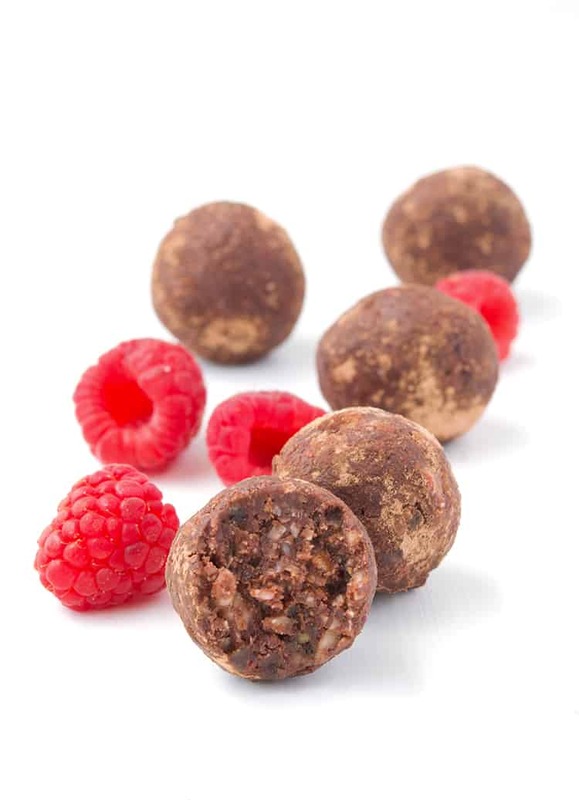 Made with fresh dates, raw almonds, cacao powder, coconut and raspberries, these Chocolate Raspberry Bliss Balls are packed with flavour. They’re really easy to make too! Well I hope you finished 2017 off with a bang and are ready for what 2018 has in store. I’ve spent the last week getting sand in my hair squeezing in as many beach trips as I can, with a little post-Christmas shopping in between, AND a few tasty brunch dates, before I head back to work today. But get excited because 2018 is going to be a wonderful year for Sweetest Menu with many more sweet surprises on the way! If you’re on the hunt for more health-ish treats to get you through January, try my Gluten Free Pecan Almond Cookies. 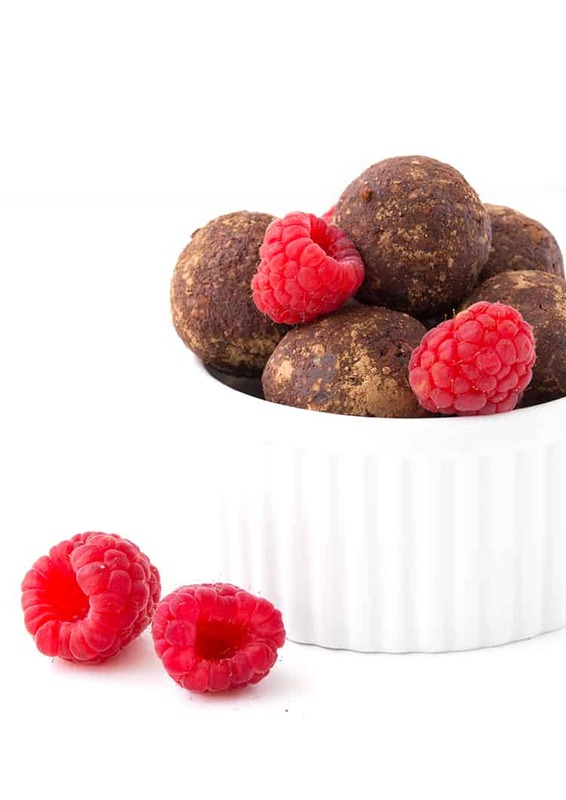 Delicious chocolate raspberry bliss balls that are gluten-free, dairy-free and easy to make! Place the dates in a bowl and cover with water for 30 minutes or until softened. Drain and remove pips. Add dates, coconut, almonds, cacao powder, coconut oil, vanilla and raspberries into a high-powered food processor. Process for 1-2 minutes or until smooth. 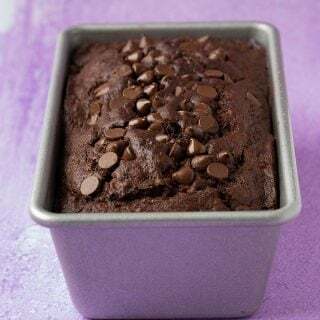 Place a tablespoon or two of cacao powder to a small bowl. 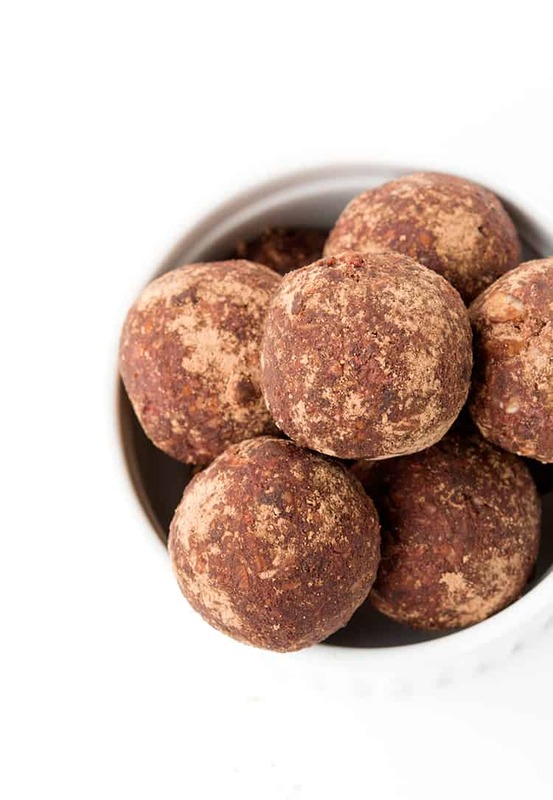 Roll bliss ball mixture into small balls using your hands, then roll each one in cacao powder. 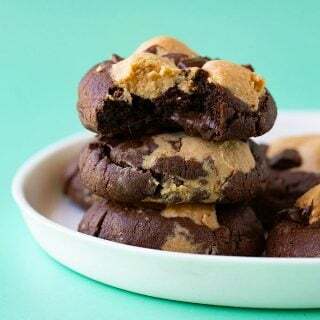 Place on a tray lined with baking paper and place in the fridge for 1-2 hours. *If your food processor isn’t the best and doesn’t grind things very finely, you can use almond meal instead of almonds. 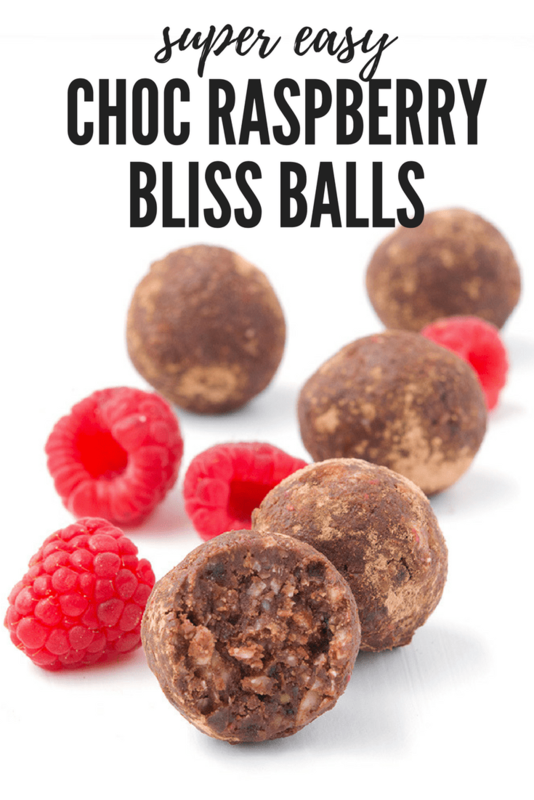 Keep bliss balls in the fridge in an airtight container for up to 5 days. Is it 100 calories in one or all? Hi Steven, it’s 100 calories per serve which is 1 bliss ball. We make these all the time and enjoy them all week! So glad to hear that Josh! They’re such a good lunch box treat! What a great snack! Can’t wait to try these bliss balls! Thanks Natalie! I hope you enjoy them!